Eating the World is the project of a husband-and-wife team of PhDs, Lindsay & Matt (collectively known as “The Eaters”), dedicated to eating the world’s cuisines both on our travels and in our own backyards, one country at a time. Neither of us are chefs or study food academically. Lindsay has a PhD in Communication Studies and Matt has his PhD in Art History. If you need to tell us apart, Lindsay does most of the writing, and almost all the short posts. Matt tends to write longer posts, and goes on and on about his insatiable spice tolerance. Yet our end goal is the same: nothing less than global conquest by eating the cuisine of every country on Earth (even you, Niue). Check out our map to see how we are doing. Much of this page concentrates on spots in the Midwest – where we live – and a very good source for international foods. But whenever possible, we like to get out of the country for a little food exploration. In the past few years we’ve reported on food from our travels in Belgium, Brazil, Cambodia, Denmark, England, France, Greece, Italy, Malaysia, Mexico, Morocco, Portugal, Singapore, Spain, Thailand, and Turkey. With all this exploring, a great part of the fun for us is realizing the futility of our quest. When we sit down to have Nonya cuisine in Singapore, it may be a check off the country list, but it only makes us further realize the incredible diversity of a global cuisine. Do we really have to give up South Carolina’s best barbecue just because we already covered America by eating a deep dish pizza? We think not. In sum: Some day we may hit every country; but we will never be done exploring. In August of 2007, the Eaters were in Paris for a short vacation. While the traditional French fare was, as always, wonderful, one night we wanted to try something different than Crêpes and Steaks au Poivre. 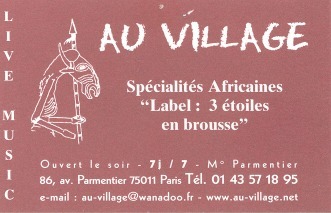 We ended up at Au Village, a Senegalese restaurant on Avenue Parmentier. It was tiny, slow, packed and wonderful. And this got us thinking: how many different national cuisines had we eaten? We began to jot down a list as we savored some brilliantly spiced orange chicken and yassa poulet. Looking at our list gave us a renewed interest in exploring as much of the gastronomical world as we could. Right then and there, Eating the World was born. Q. How do you know when you have eaten a country? 1) Eat cuisine from a restaurant that explicitly serves the food from that country, or from a pan-continental/fusion restaurant that labels its dishes by country. Pan-Asian, Fusion or General Mediterranean/Latin/Middle Eastern restaurants don’t count on this list. We may review them – and why not? – but they don’t count on the map. We also agreed Outback Steakhouse doesn’t count as Australian. You know what does? This place. Q. Do recipes count on the map? A. Nope. And wouldn’t life be easier if they did? While we love cooking at home and have some great recipe books, half the fun is dining out and having a new experience. Q. What are your favorite national cuisines? L: Thai, Italian, Lebanese, Ethiopian. M: Indian, Italian, Peruvian, Thai. Q. What would be your last meal? A. Mom’s pasta and sauce. And each of us think our Mom makes it the best. Q. Where is that photo from? A. Nasa’s image of the day website, – a bite. you can contact us at EatingTheWorld at Gmail.